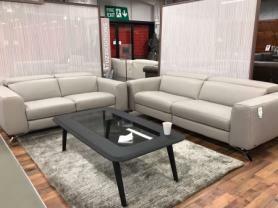 Beautiful thick soft Italian protecta leather 3 & 3 seater sofas. Slim and sleek design which give it the modern look. Pocket sprung seating which makes the sofa extremely comfortable. Lovely off the floor wooden feet. Approximate Measurements: 3 Seater: 195 cm. Depth: 95 cm.